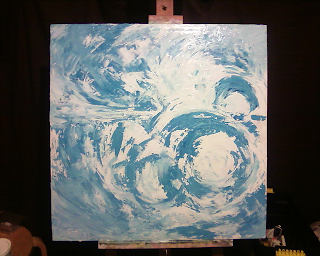 I received a gift of this amazing canvas with the hope that I'd create an abstract painting. So I am. I've begun the very textural base coats. The first layer was a very heavy, knifed coat of gesso. 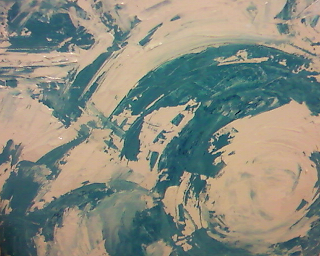 The second is of gesso and phalo blue. I intend to keep the image very heavy and thick. The color sets I'll be using will be primarily translucent by nature. Phthalocyanine blue is perfect for creating this perceived depth through it's translucency. Adam, I really like your work, how do i get a picture for my wall? I finally have an apartment where i can hang pictures, and I really want one of yours. I do commissions and requests. But still spell badly.